We are a manufacturer of stretch film and packaging machines, have already advised and helped thousands of customers. We optimize packaging processes and therefore, as a result, we offer cost reductions and sustainability, which are really calculable and provable. With currently 65 employees in all branches and constant expansion, we have remained a flexible, innovative company with flat hierarchies. ENO© It´s more than just a Name. It´s rather a brand, a symbol of Passion for stretch film. We are “the ones with the red core,“ the original. While you are often forced to buy thick and heavy cardboard tubes at least for the price of the stretchfilm, we offer you the light 900g red core. Because less weight, will cost you less and saves the Environment. 2012 | holding force – Start of the development of special stretch type with the focus on an increased Holding force and load securing. 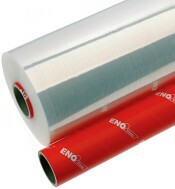 2013 | ENOxtrem is a revolutionary innovation in the stretch film market, for the first time combining the properties of Blown- and Castfilm together. The film can be stretched bidirectional in an impressive way and at the same time it offers an extremely high puncture resistance. 2013 | New development of a mobile measuring system for testing the Holding forces on the packaging material at the customer site. For an optimal comparison of the performance of different foils at your site. 2015 | ENOdrive – Rugged and mobile semi-automatic stretch Robot with many Advantages for our customers .